Note: .NET Framework 4.0 is required for running the binary program. Visual Studio 2012 is required for opening source project. For a given set of data points, interpolation can be defined as construction a polynomial which passes through every of these data points. Visually, interpolation can be interpreted as finding a curve that passes through all points on a graph. 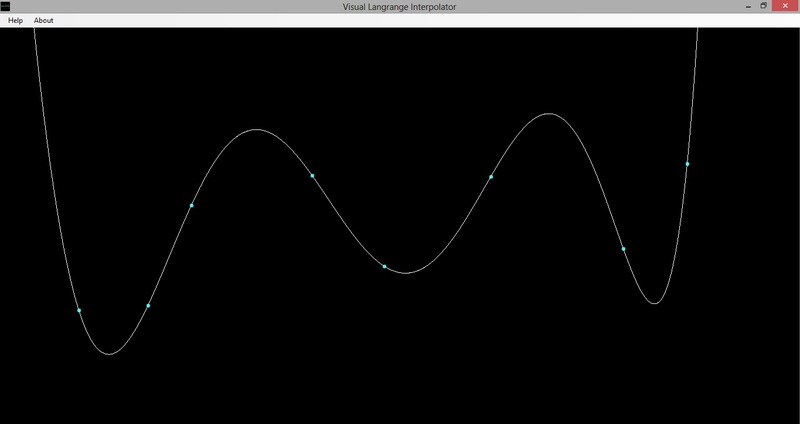 This program demonstrates “Lagrange Interpolation” visually. Users select some points on a grid, and the program will draw a curve that passes through each and every of the selected points. Not only does this program interpolate the data points, it also extrapolates to estimate how points beyond the given data set will look like. Below shows a quick preview. Selected points are cyan in color. The white line shows the curve derived from interpolating the selected data points.